You know, if there is one way to get rid of all the trash in the world, we might as well be a Time Lord and travel to the future, where the folks there would have figured out how to vaporize trash the safe and clean way, or at least have some means to keep the earth green. Dump all our rubbish there and that’s that. Unfortunately, since time travel remains a fantasy at this point in time, it will just be you and your imagination, and with $89.99 in exchange for the Doctor Who TARDIS Trash Can, there ought to be no more mess around your workspace. This office-sized TARDIS trash can will actually light up and play some cool sounds whenever you open and close it, but you will still need to empty it yourself of its contents at the proper place once it is stuffed to the brim. There is a switch located under the lid that allows you to turn off the sound effects just in case it proves to be too disturbing to the rest of your office mates. 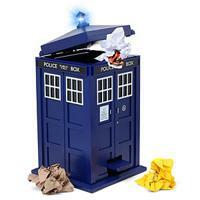 The Doctor Who TARDIS Trash Can will run off a trio of AAA batteries. Me and my husband have always been looking for cool trash cans. We have many cool, unique things in our house, so I want something unique for our trash cans too. This Police trash can is so cool, Dan should see this.